SchoolCity Suite offers the option to create a writing prompt as an item type. This allows students to respond to the prompt, similar to a constructed response and be graded using a rubric with up to 20 objectives. This is scored by the teacher, or staff member with appropriate permissions and the score will reflect the performance on each of the objectives as determined by the rubric. 1. From the Top Menu Bar, select Item Banks (1a). c. In the selected Work Space, click on Create Item (1c). c. Pilot Item: Slide No to Yes if you want to flag this item as a Pilot Item. A Pilot Item will be highlighted in pink in all areas of SchoolCity Suite. When used in an Item Bank assessment, Pilot Items will calculate statistics in the Item Analysis Report, but the item will not contribute to the total possible points on an assessment. d. Subject: Select the subject (content area) from the drop down list. e. Grade(s): Select the grade(s) in which the item will be used or is appropriate. f. Course Group: (optional)Select the Course Group, if created in the Group Manager, for which the item will be used. g. Course: (optional) Select the Course for which the item will be used. h. Passage: (optional) Link a Passage by clicking on Link Passage. Select from the published passages in the Work Space. i. Include Teacher Instructions: (optional) Slide No to Yes, and enter the instructions in the text box. j. Question: Enter the writing prompt question in the text box. k. Number of Objectives, Objective Name, Point Range, Delete: Enter the number of objectives on which the written response will be scored (1-20). Click Update. Complete the table as desired. l. Non-numeric Value: A score of 0 may be replaced with NS or NA as shown. m. Total Possible Points: Once Objective Point Range has been entered, the total points will be calculated. n. Include Standards for Objectives: (optional) Slide No to Yes to include standards for each objective. p. Sample Response: (optional) Include a sample student response. q. Save/Next: Click Save to save your work, or Next to move to the next step. Your work will be automatically saved. a. Slide No to Yes to include a rubric. b. Upload Teacher/Student Rubric: Click on the folder icon to upload a PDF version of the rubric. c. Teacher/Student Rubric Name: If not uploaded, type the name and rubric description in the text boxes. 4. Select Standards: If standards were added to the Objectives (2n), they can be selected in the next step. b. Standards will populate to the right. Select the standards by checking the box next to the standard description. c. Tag Item for easier search capability in the Work Space. d. Previous/Save/Next: Click on Previous to return to the previous step, Save to save your work for later, or Next to move to the next step in the setup process. a. For each Objective, use the drop down list to align to one or more standards. b. Previous/Save/Next: Click on Previous to return to the previous step, Save to save your work for later, or Next to move to the next step in the setup process. a. Administration Method: For this item type, online is the only option. b. Online Tools: (optional) Select any tools that might be appropriate for students to use. c. Blooms Taxonomy: (optional) Select from the drop down list. d. Depth of Knowledge: (optional) Select from the drop down list. e. Difficulty Level: (optional) Select from the drop down list. f. Point Bi-Serial Number: (optional) If known, enter the number. g. P-Value: (optional) If known, enter the number. h. Previous/Save/Next: Click on Previous to return to the previous step, Save to save your work for later, or Next to move to the next step in the setup process. a. Item Question, Objectives, Point Range, and Standards: If any changes need to be made, return to the previous steps to revise/edit. b. PDF Item Preview: Click here to preview a PDF of the item. c. Tag Item: Click here to tag this item, if not done previously. d. Create Item: Click her to create another item. e. Copy Item: Click her to make a copy of this item. f. Return to Work Space: Click here to return to the main Work Space page. g. Item Properties: Use the blue scroll bar to view all properties. h. Previous/Publish Item: Click on Previous to return to previous steps. Click on Publish Item when it is ready to use in an assessment. a. Select the Work Space where the item will be housed. b. Click on Publish (or Cancel if not ready to publish yet). c. A confirmation message will appear. Click OK to continue. 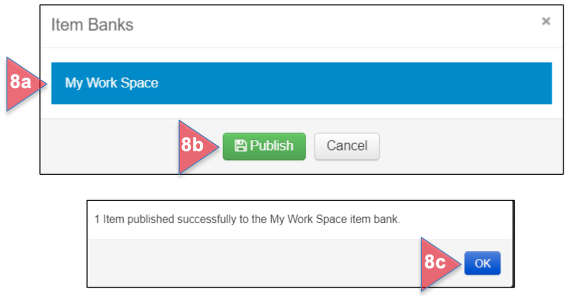 d. In the Work Space, items that have not been published will show as Complete in the Status column, while published items will show as Published. To learn more about item banks in SchoolCity, see the guides in SchoolCity, Item Banks.